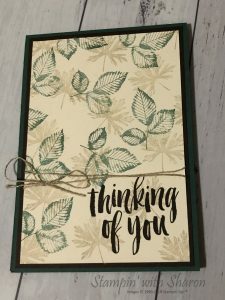 Another card with the gorgeous Rooted in Nature stamp set. I used Tranquil Tide, Night of Navy, Very Vanilla & Soft Suede Card Stock. I stamped the sentiment & the Tree in Early Espresso Ink. This tree is gorgeous but felt it was a little plain so added the flag for the sentiment. I think this makes a great Fathers Day card. Today is Fathers Day so I have given this card to my husband. This was a simple easy card to make for one of my recent classes. 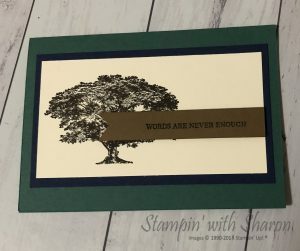 I used the Rooted in Nature stamp set. I used Tranquil Tide card stock as the base colour as it is one of my favourite colours in this current catalogue. I stamped in Tranquil Tide and Sahara Sand ink randomly on the Very Vanilla card stock. I also stamped the sentiment in Early Espresso ink and tied the linen thread around the Very Vanilla card. During August if you spend $90 on product you can earn a $9 voucher to spend next month. This is part of the Bonus Deals promotion that Stampin’ Up! have at the moment. If you’d like to place an order you can order online. And if you use the hostess code A2GV4THE during August I will send you an little gift. There are only a few days left of this promotion. Here is a suite that is absolutely gorgeous. Great for Masculine cards. I feel like I haven’t used this set a lot but then when I look at some of my samples I realise that I have made quite a few cards with this stamp set. 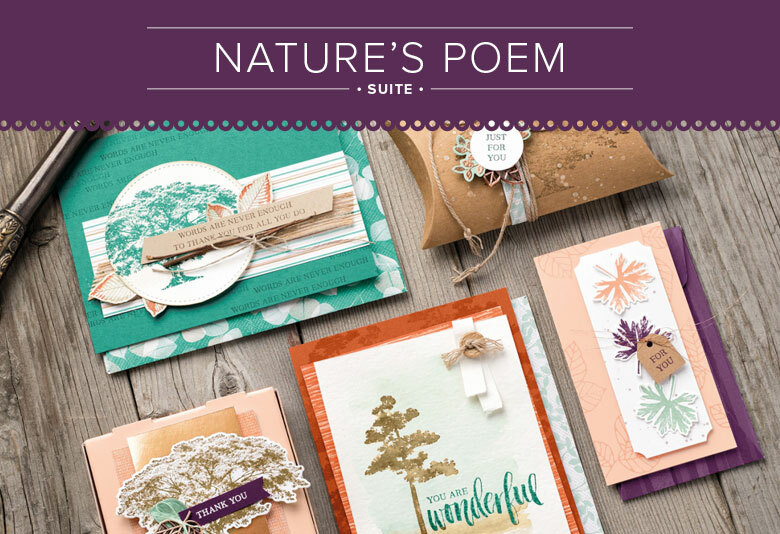 The Stamp set is called “Rooted in Nature”. It is a double case stamp set with 16 stamps including 6 sentiments. This stamp set is quite versatile. It can be used for so many occasions including birthdays, thank you’s, sympathy & even christmas cards. I personally haven’t purchased the dies with this set as yet but they are on my wishlist. There are 12 dies in the framelits set with 9 dies cutting out images from the stamp set and 3 dies that are embossing dies to be used with the new Embossing Mats.